In the fifth and final season of this explosive drama series, the show expands its focus into the media — specifically the role of newspapers in big-city bureaucracy — as it follows the fictional staff of a real newspaper. THE REVIEW: One thing I’ve alluded to but never mentioned explicitly in my reviews for The Wire so far is the show’s ability to depict the goings-on of life in such a straightforward way. This may seem cliché to mention, especially considering it’s one of my more common compliments — it was the number one reason why I found The Sopranos to be so appealing. But it’s never an easy task to accomplish, and when a show like The Wire can bring the lives of the people of Baltimore — police, politicians, drug dealers, addicts, and regular citizens — to life, it deserves to be recognized for it. In episode four, “Transitions”, Sgt. Carver (Seth Gilliam) tells his pal Herc (Domenick Lombardozzi) that, “It all matters.” Everything in life, no matter how small or seemingly inconsequential something is, it matters. Yes, people make mistakes and you have bad times, but that doesn’t mean you should cover it up and pretend like it never happened. “It all matters.” And with The Wire, this statement has never been more evident than in season five. In this final season, it’s all about tying up loose ends and showing how things have changed (or not) since the first episode. It isn’t like Lost or Battlestar Galactica which went to great lengths to answer all remaining questions and upset fans in the process because it took some of the mystery out of the show. The Wire answers questions but stays true to the spirit of the show: an investigation. Mimicking real life and the investigations that the Major Crimes Unit (and homicide, and narcotics, and all the minor investigations too) is the heart of The Wire. Seeing the various crews running their corners speaking slang that can be difficult to understand all of, mixed with the inner workings of a police department is the draw. It’s the show’s invitation into a new world through the magic of filmmaking (or television-making). And it’s such a strong attraction too. Over the years I’ve seen my fair share of drug-related films and television shows (Breaking Bad, pretty much any Scorsese film, and more), but The Wire is different, is unique. It’s not just about the drugs and the addictions — both to using the drugs and to selling them (the game is the game) — but rather about the people and lives behind it. Why do people do what they do? Are our lives written in fate or can we alter our path? These are big questions, ones that are asked by everyone all the time. The Wire doesn’t necessarily set out to answer them, but it does set out to help with our understanding. If mimicking real life is the draw to The Wire, than the investigations are what keeps us watching. The investigations provide the mystery and suspense, the conflict and drama. Again, this show isn’t the first to tackle the “police” or “mystery” genres but it is one of the best. Very rarely does an episode end on a cliffhanger which is an easy way to build up suspense and excitement for what is going to happen next. Instead, The Wire relies on your loyalty. Most seasons take a few episodes to build-up to a point where you’re fully invested. Season three meandered along until about episode five or six and the others usually needed a couple episodes before it felt like I couldn’t stop clicking “next episode”. But there’s a difference between loyalty and patience. The Wire can rely on loyalty because it’s earned and warranted. The show is so great that you’re willing to see where it takes you, even if that means watching a few episodes that seem to go nowhere. Season five is the best season of The Wire because it exemplifies all of what I’ve just talked about. The stakes are higher and we can tell early on that this will be the end of the line for our favorite characters. It’s clear from episode one, “More With Less”, that by the end of the season, the tale that creator David Simon and his crew set out to tell will be over. Some characters are long dead, some will die, some will live. But season five is all about the choices you make and dealing with the consequences of your actions, and boy are there a lot of radical choices that are made (I’m looking at you McNulty). THE TAKEAWAY: Season five of The Wire is the best in the series. But more than that, it encapsulates an entire series-worth of amazing storytelling that is unparalleled. Certain themes, characters, and plot lines may seem run-of-the-mill, cliché things that you’ve seen in other television shows or films, but I can guarantee you that The Wire does things differently and it does them better. This show does away with the rules and charts new territory. Never before have I seen a show where they cycle through whole new groups of cast members each season to focus on an entirely different topic. Never before have I seen a show so deftly tell individual stories by season while simultaneously telling a greater story over five seasons. The Wire deserves all the hype and praise you hear about it. It may not be as influential as The Sopranos was in terms of redefining what is possible with television, but it certainly is the more entertaining and impactful of the two. As for the series finale, one of the most discussed parts of any TV show in the modern day, I must say it was expertly handled. 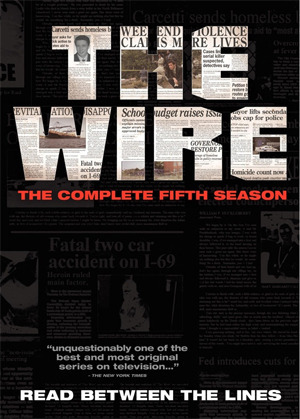 Not the most daring or innovative (no cut-to-black à la The Sopranos, the time jump in Battlestar Galactica, or whatever they did in Lost), but the series finale for The Wire is by all means satisfying. In my reviews for season three and season four, I remarked how well the finales were handled and that if the series end like every end to a season, I would be happy. Well sure enough, for the end of season five we get another montage that shows the paths all our favorite characters take. The best part about this is that it leaves stories open while still providing closure. We don’t get concrete answers, but rather, glimpses of the paths our main characters will lead. This is most definitely a show I will be watching again in the future.